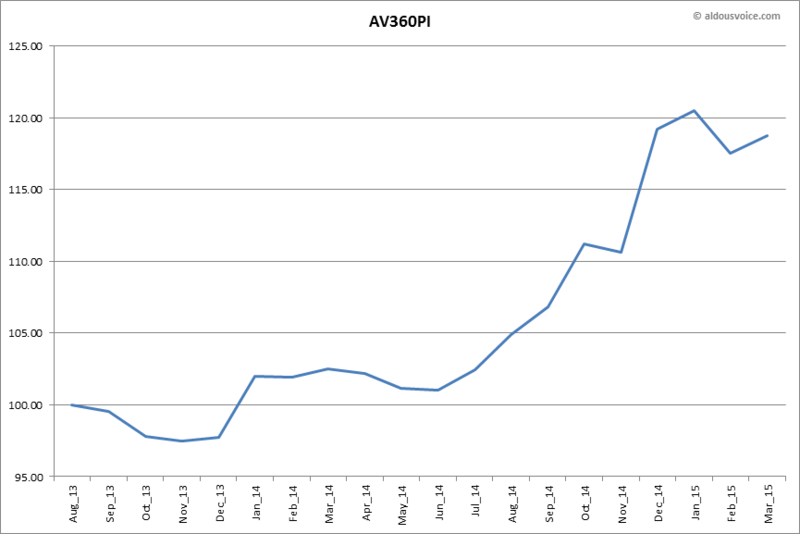 Ferrari 360 asking prices remained firm over the last month – average asking prices have increased 1.02%, reversing half of the drop reported in the prior month. The price index now stands at 118.75. Activity continues to be strong at the upper end of the spectrum. 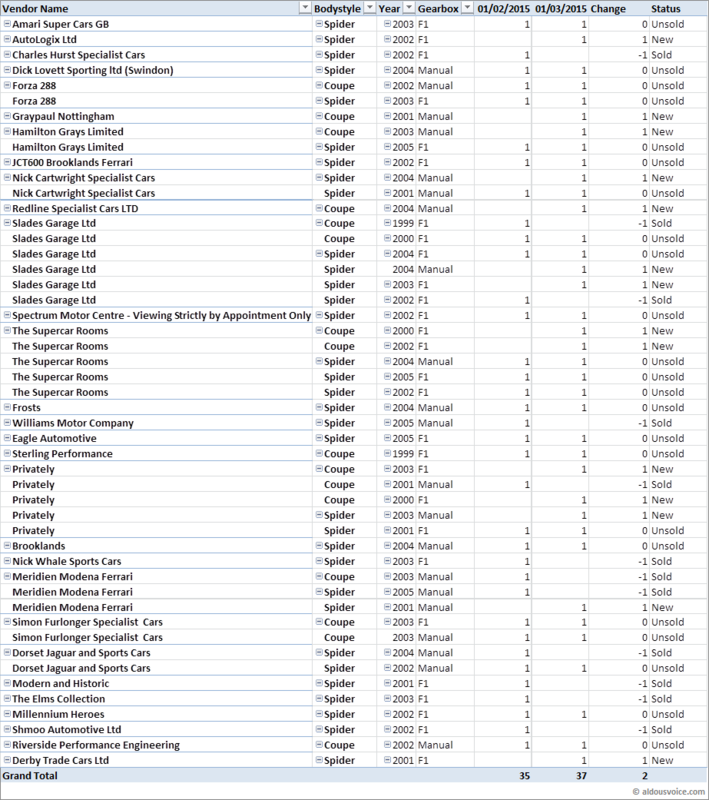 I have been involved in a few 360 transactions during the month, both on and off market. If someone had told me a year ago the levels these cars have sold at, I would not have believed it. 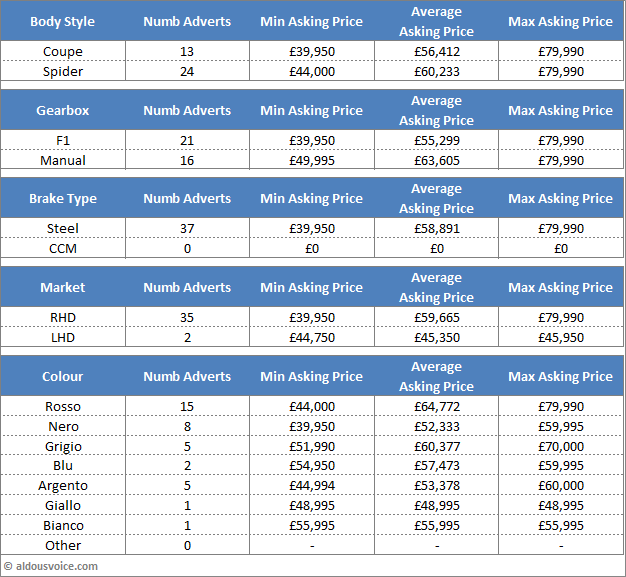 The number of cars on the market has has increased a touch to 37 but that disguises the 12 cars that have dropped out of the data (presumably sold) and the 14 new entrants. This turnover needs to be added to the off market transactions which are most definitely happening. 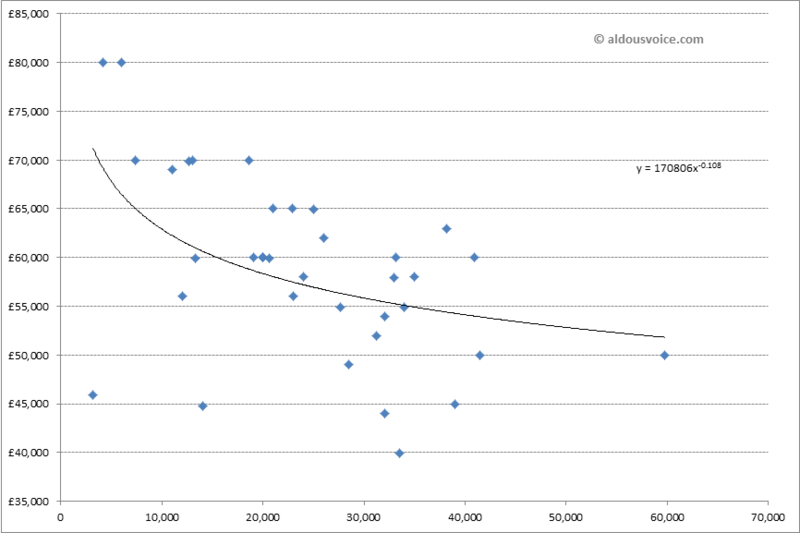 Here’s the plot of asking prices against mileages. Note the car offered for sale (privately) at £50k with nearly 60,000 miles on the clock. This is a real indicator of how crazy things have become – two years ago a similar car would have been listed for a little over £30k! 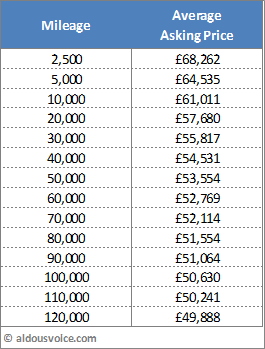 Here is the table of average asking prices for different mileage points. Note how the optimistic vendors of high mileage cars has reduced the price differential between the big mileage intervals. 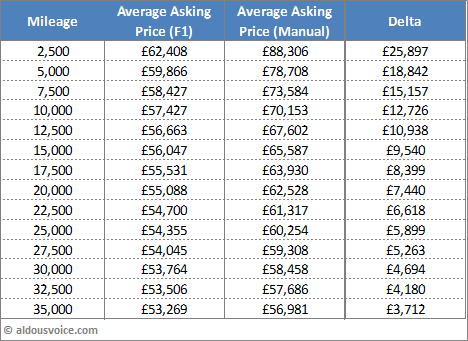 The average asking price of a 20k car vs a 30k car is less than £2,000. 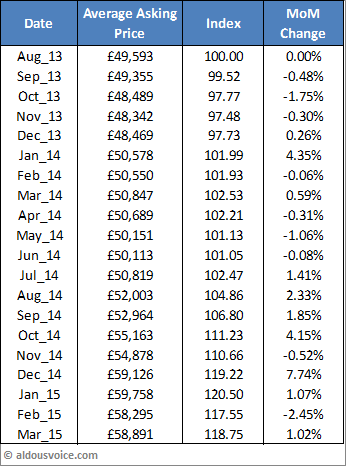 Personally, I believe this to be wrong and would expect the expensive higher mileage cars to remain unsold. The overriding theme that has been present in all of the transactions that I have been involved in this month has been the requirement for a manual car. 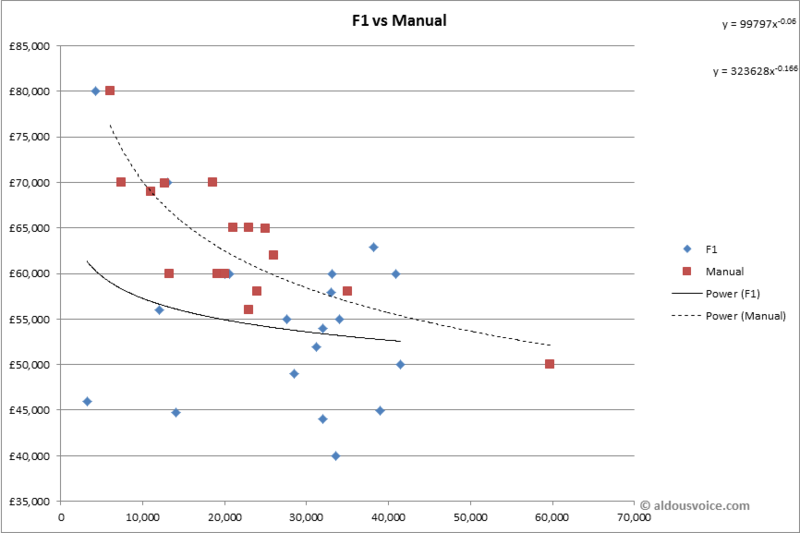 This is reflected in the data, manuals are priced at a significant premium to F1 cars. That’s it for this month. 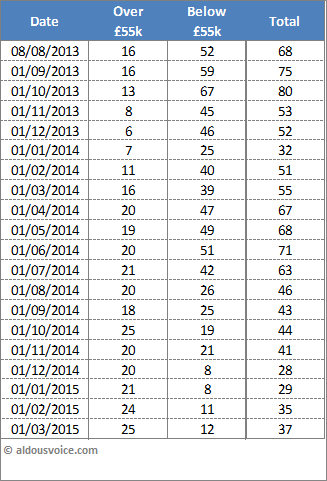 As usual, please feel free to drop me a line if you want any data in particular. I look forward to this every month :). (I have a 38k miles manual Modena, in Grigio Alloy). Can you share some information re: the sales you are aware of? Would be interesting to see asking price vs actual price sold, and for what. Not interested in the details of the owners, just the cars. You say things have gone crazy for manual cars… what have you seen? I’m sorry but I’m not prepared to share details of the transactions I am party to. I can say that I see cars being sold very close to the asking price (when they are advertised).